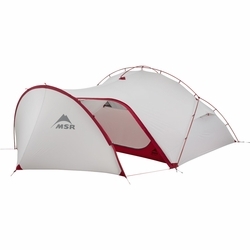 MSR Hubba Tour 3 Tent. Three-person, full-protection adventure touring tent. Adventure touring as a trio—or a space-optimizing duo—requires a tent with something extra. The Hubba Tour 3 tent provides protection for the three of you and all your gear, with livable features to go around. When there’s more rain than shine during setup, the unique exoskeleton frame pitches fast, and the tent’s unified rainfly and body helps keep the interior dry. Spend weeks on backcountry trails or a month on the backroads in the comfort and convenience of a Hubba tent enhanced with a large vestibule for stretching out and a protected floor area for stashing gear.